What style building do you live in? Is it a skyscraper, a Victorian home, or a modern building? 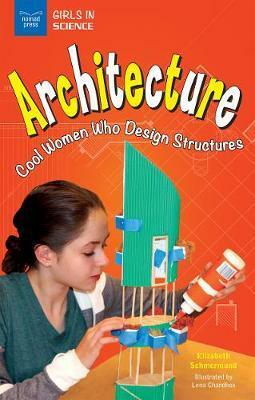 In Architecture: Cool Women Who Design Structures, readers ages 9 to 12 examine the stories of women who are today designing the houses, schools, museums, and public spaces where we spend our time. Architecture is the planning, designing, and construction of buildings and other structures. It's architects who figure out what style of building fits best in a certain space, what the structure should look like, how it needs to be built to withstand the environment, and what materials best suit the needs of the people who are using the structure. Art, engineering, science, technology--architecture involves all these disciplines, and more! Architecture: Cool Women Who Design Structures examines the history of architecture and the journey of three women who are working as architects today. Patricia Galv n works in commercial and interior architecture and is the chairwoman for the American Institute of Architects' Women in Architecture committee. Farida Abu-Bakare was born in Qatar and raised in Canada. Today, she is an architect who designs science labs for universities and other institutions. Maia Small works as an architect and urban designer at the City of San Francisco Planning Department. She has also taught architecture at Harvard University, Rhode Island School of Design, and Massachusetts Institute of Technology. Sidebars on important female architects throughout history, quotes, and essential questions for readers are included throughout the text in order to encourage critical thinking and self-drawn conclusions. The book also includes a timeline, glossary, and further resources for readers to further investigate the topic. -School Library Connection - "A treasure trove of discovery, this interactive series promises to influence the next generation of female science stars. Glossary. Timeline. Index. Highly Recommended." -NSTA RECOMMENDS - ." . . The manageable-sized chapters and sections within each chapter make it a great way to foster conversation in reading groups and check for understanding. Looking at the advances in technology and the contributions of women fills a hole in many classroom and school libraries searching for more nonfiction describing contributions of women and minorities to STEM. The book is aimed at the 'tween' reader (ages 9-12) when many students lose interest in reading because books often become dull with information being presented in textbook style. This book is anything but dull and definitely not 'textbooky'. . . "
-CLEAR Reviews/Goodreads "Part history of astronomy, part biography of three notable women in science, this book offers an informative read for young women interested in astronomy either as a career or for recreation. The biographies cover Nancy Grace Roman, Maggie Aderin-Pocock and Andrea Ghez and encourages young women to follow in their footsteps with interesting facts, links and pictures. I would definitely call this a pep-rally for women in the sciences." Elizabeth Schmermund is a writer, editor, scholar, and teacher. She has written more than 15 books for students and young readers, including New Frontiers in Astronomy, The Persian Gulf War and the War in Iraq, and Women Warriors. She lives in the New York metro area with her family. Lena H. Chandhok earned her degree from the Center for Cartoon Studies in 2011. Her work for Nomad Press includes illustrating Technology: Cool Women Who Design; Astronomy: Cool Women in Space; Marine Biology: Cool Women Who Dive; Aviation: Cool Women Who Fly; Archaeology: Cool Women Who Dig; and Zoology: Cool Women Who Work With Animals. Lena currently lives in Brooklyn, New York.